The 2018 AFN Annual General Assembly was held on July 24 to July 26 at the Vancouver Convention Centre amid cruise ships and the beautiful Burrard Inlet’s picturesque setting. Controversy swirled at the convention centre as the voting took place. Candidate Russ Diabo, a policy analyst from Kahnawake in Quebec, accused Crown-Indigenous Relations Minister Carolyn Bennett of “political interference” on the Wednesday after she met with a group of chiefs on voting day. 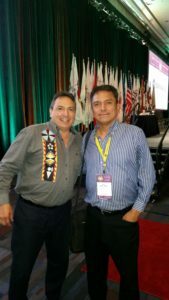 After the results revealed that Perry Bellegarde was elected national chief, Diabo addressed his closing statements to the convention centre, “You’ll suffer the consequences” in reaction to election results. A chorus of boos erupted during Diabo’s closing speech. 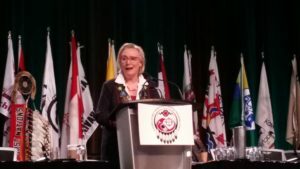 Carolyn Bennett addressed the Chiefs on July 26th to a half empty convention centre, as most chiefs returned home after the June 25th elections. Also speaking, were the families and representatives of Colten Bouchie, urging the national chief and leaders to end the injustices.